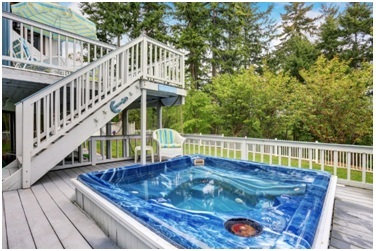 Not only will a quality hot tub for Vancouver properties offer a stunning sense of relaxation, but the therapeutic benefits provided are important factors to remember. Vancouver is one of the most humid regions within Canada and this is particularly noticeable during the autumn and winter months. As temperatures are known to dip as low as 1ºC, owning a quality hot tub offers astounding benefits. These advantages entail much more than comfort alone. Why are these relaxing appliances so very popular? What better way to decompress after a long day at work than to sit back and soak within the warm waters of a hot tub? Muscles will be eased and the stress will simply melt away. Some have even equated these experiences to mild forms of meditation. Modern tubs are great at providing a sense of peace that may not have otherwise been realistic. This is even more of an advantage when the temperatures outside become downright unforgiving. Another interesting fact is that hot tubs in Vancouver provide very real health benefits and some of these may not be outwardly apparent. For example, immersion in warm water helps to increase the circulation of blood throughout the body. This is great for those who suffer from low blood pressure or other chronic circulatory conditions. The massaging action of pressurised jets is able to loosen cramped muscles; perhaps even saving a trip to the local therapist. Those who suffer from lower back pain or who may have incurred a recent injury can also benefit from such tubs. There are hot tubs designed for nearly every need imaginable. The number of massaging jets can vary and some can be focused into a specific direction. Sizes will likewise differ; accommodating the needs of homes of different sizes. The temperature of the water can be adjusted with the click of a button. From mildly warm to temptingly hot, there is a setting for everyone. Thanks to the sheer variety of options, hot tubs should never be considered a luxury. There are now countless Vancouver homes which can enjoy the presence of one of these amazing gadgets. Whether one requires a hot tub to alleviate a long-term condition or simply appreciates the sense of relaxation provided, professional suppliers will offer a nearly limitless number of targeted solutions.